200ml of egg whites. I find it easier to measure egg whites this way, because at my place the eggs come in all shapes and sizes from our backyard chickens. 1 ½ cups of caster (super fine) sugar. 400 ml of cream: 200ml for whipping, plus another 200ml for mixing with the chocolate. Mixed berries. I used strawberries, blackberries and blueberries. 2 ½ teaspoons of white vinegar. Preheat oven to 130 degrees C. Line three baking trays – I use pizza trays – with baking paper, and mark a circle on each, aprox 20cm in diameter and set aside. Very carefully separate your egg whites from the yolks. I use a groovy little kitchen gadget that I think came via Tuppaware years ago, but on the days when that gets lost in my junk drawer, just cupping your (clean) hand and letting the whites slide through your fingers does a pretty good job. Divide mix into three, and spoon onto your baking trays. Using your circles as a guide, smooth out mixture as much as possible, and keeping the sides tidy. Add to the oven, turn heat down to 120 C. Bake for 1 hour, 10 mins (Confession – mine were ready at one hour exactly, so do keep an eye on them), then turn off the oven, open the door and allow the meringues to cool completely. While your meringues are cooling in the oven, melt the chocolate over a double boiler with 200ml of cream. A double boiler is basically a saucepan with a little bit of water in it and low heat, and another large bowl placed directly over it. Don’t allow steam or water to come into contact with your chocolate. Stir constantly, and eventually it will come together in a chocolate sauce. Allow to cool. Prepare berries, and whip remaining 200ml of cream. I always add a dash of vanilla extract. On a serving dish, very carefully place one of your cooled meringues. Using about a third of your chocolate ganache mixture, smooth on top of the meringue, followed by a third of the whipped cream and berries. 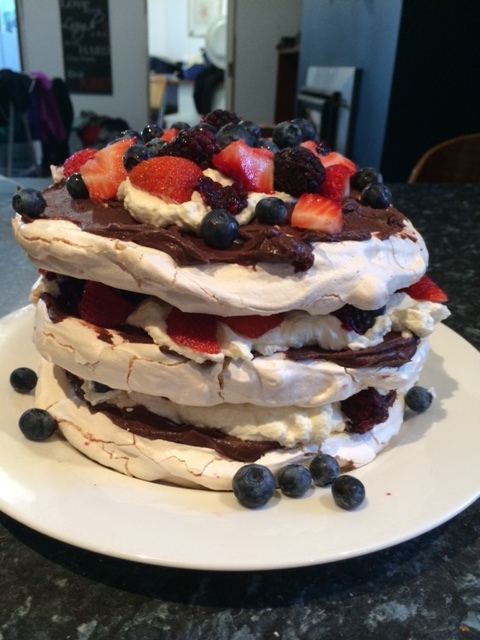 Place your second meringue on top and repeat the process, then the final meringue, chocolate, cream and berries. For serving on Christmas Day, you could add more berries to the plate, tinsel or baubles to decorate. Good luck Cook Clubbers, I’m looking forward to seeing what Bel comes up with!